Defense Minister Brigadier General Hossein Dehqan made the announcement on Monday during a ceremony held in Tehran to launch the production line of the new domestically-built hardware. Among the achievements unveiled at the event were the Fajr 5 guided artillery rocket, Misagh 3 shoulder-fired missile, a 40-milimeter grenade launcher, a caliber gun and a pistol. 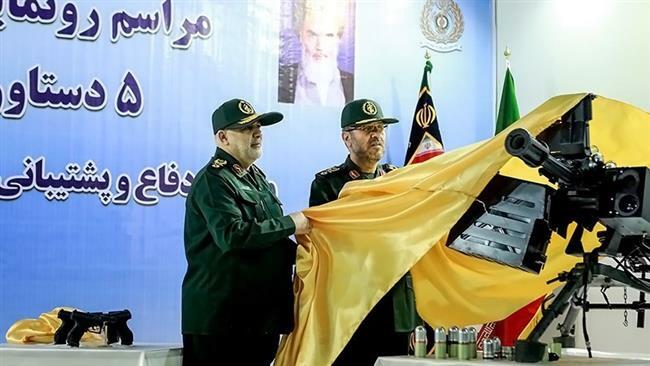 Speaking at the ceremony, Dehqan said by manufacturing the new equipment, the Defense Ministry has “taken a great leap forward” in its efforts to boost the preparedness of Iranian Armed Forces in individual warfare and air defense. Over the past three years, he said, over 115 types of defense systems and military hardware have been manufactured and put to use, up by 69 percent compared to previous years. The Iranian defense chief further hailed round-the-clock hard work by Iranian experts to upgrade the military systems used by the Armed Forces with the help of domestic science and capabilities. The Islamic Republic has reached self-sufficiency in producing essential military equipment and systems. Each year, the country inaugurates a series of new defense projects aimed at boosting its readiness in the face of potential enemy threats. Iran also conducts maneuvers from time to time to test the combat readiness of its Armed Forces as well as the domestically-manufactured military hardware. Iran to use missiles against hostile bids: Cmdr. Over the weekend, the Aerospace Division of Iran’s Islamic Revolution Guards Corps (IRGC) held defense exercises in the north-central province of Semnan. Different types of missile and radar systems, designed and manufactured by Iranian specialists, were used during the military drills.